All applications for admission to the Dual Language Immersion (DLI) program are accepted online beginning on January 16, 2018. The link to the application form will be publicized on the district website, through PeachJar, on TCSD social media accounts, and by each individual school. 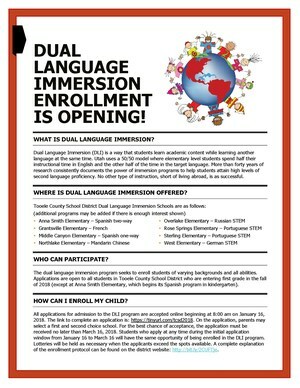 On the application, parents may select a first and second choice school to apply for participation in the DLI program.